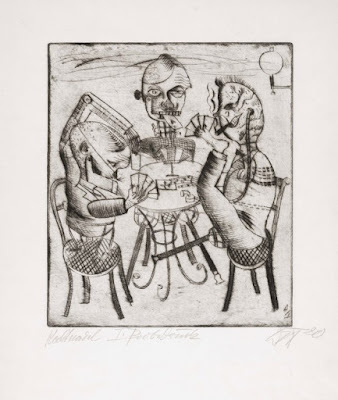 I am looking for a George Grosz image that might have inspired Giger and then I suddenly see the black and white drawing of the card players by Otto Dix, I suddenly have a sense that it might have been something that interested Giger, I took a closer look at it and noticed that these were crippled men with prosthetics. 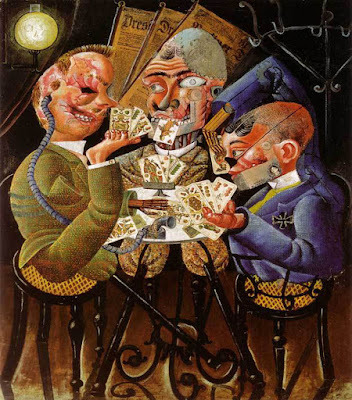 I suddenly find the colour painting that Dix did and then realised that here in "Otto Dix's Skat Players - Card Playing War Invalids" (1920) were examples of early biomechanoids. 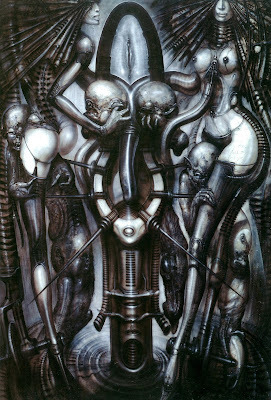 Surely an example of something that HR Giger would have wanted to reference in one of his paintings, but my only question is which one or ones. The painting for me matched up with two of Giger's works in different ways. Necronom IX which had decided referenced Salvador Dali's "Daddy Longlegs of the Evening - Hope!" as well as the monster from the movie The Fly and perhaps Pazuzu. 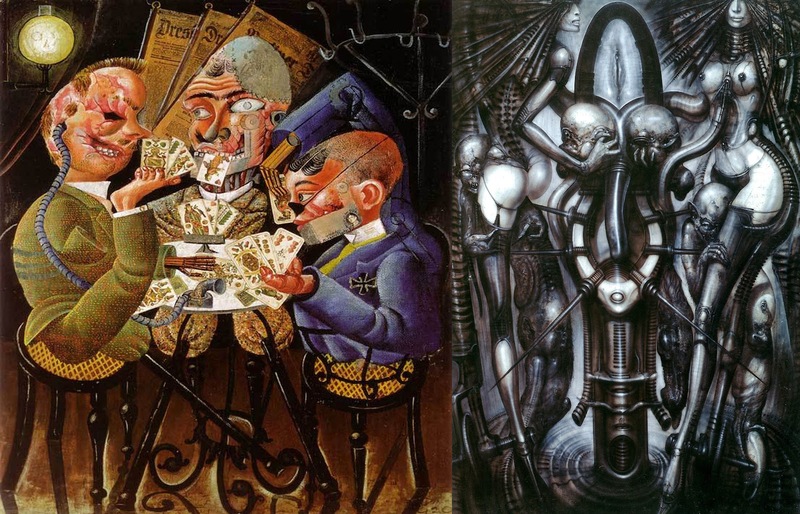 Also I decided that Giger had referenced it in his painting Witches Dance which also reference Max Ernst's Robing of the Bride. 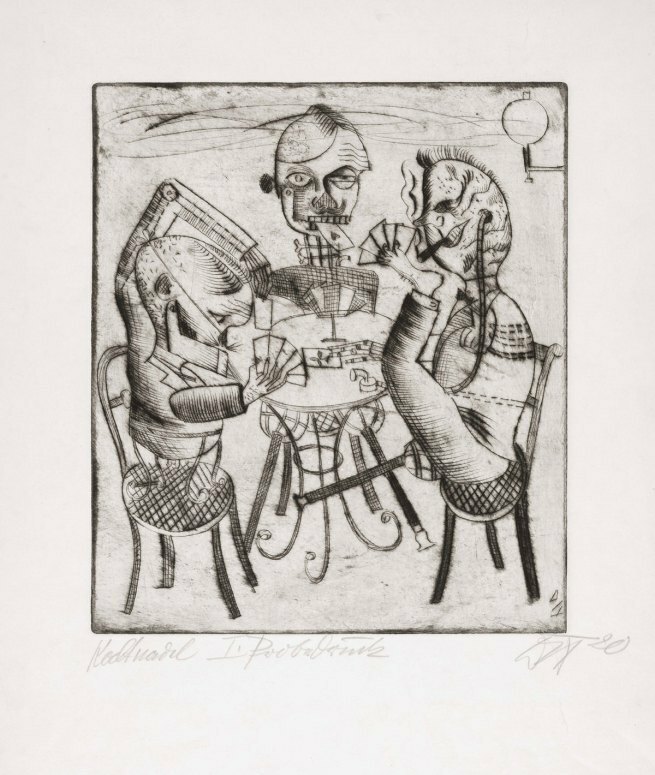 ""Otto Dix's Skat Players- Card Playing War Invalids" (1920)"
The man on the right appears to have been referenced in Necronom IX. The shoulder joint and the hump on the back in the Dix image have transformed into the curving penile form. The front of the jacket around the shoulder has transformed into a hand. The upper arm a tendril or insect arm. 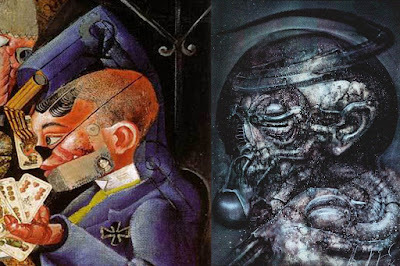 The Necronom lacks a nose in the same way, the cuff of the jacket turns into the point where the flesh disappears on the wrists and gives way to the under structure of the arm and perhaps other comparisons are a little too distant to make because this is quite a confusing painting. 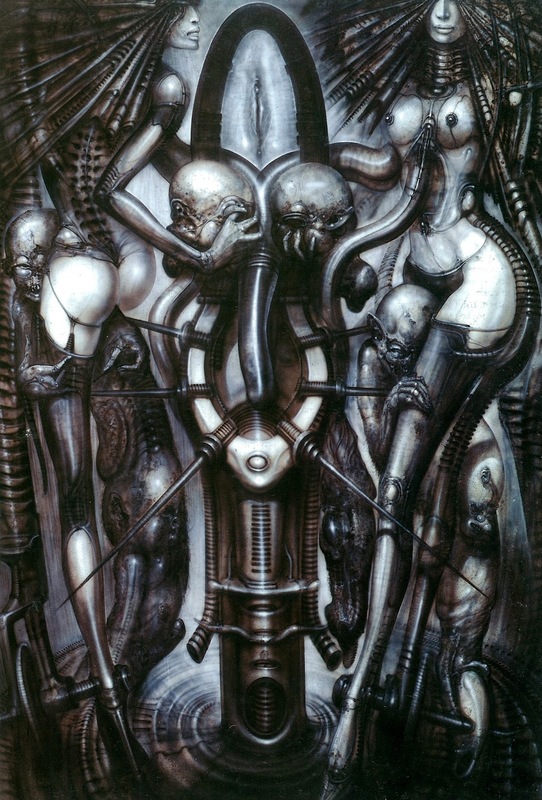 Giger's painting also appears reference a Dali painting "Daddy Longlegs of the Evening - Hope!" 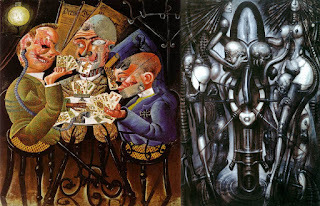 c) Comparisons to "Witches Dance"
Meanwhile in Giger's painting "Witches Dance" which also references a Max Ernst painting "Robing of the Bride", Giger takes Dix's painting and transforms the central character's leg stumps into head, and the seats at the side into the buttocks of the two women. The ear trumpet pipe on the right turns into the spine of the left witch and the right hip of the woman in the right. while the lightbulb at the top left gets moved to the right and turned into the right woman's face while the coast stand on the right gets moved to the left and is turned into a woman's head seen from the side. The legs of the central stool become transformed into a podium for the Marcel Duchamp inspired urinal/fountain. 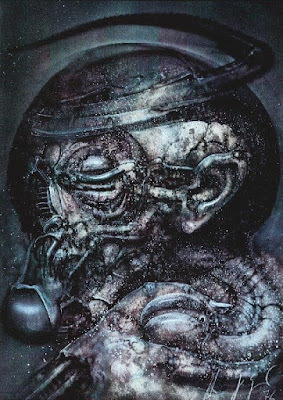 The central man's eyebrows and nose become pipes running across the upper parts of and in between the central two head like shapes in Giger's painting that reference the man's leg stumps as if the heads have become the eyes. Do the newspapers in a fan like display also contribute to the fan like structures around the witches heads while in Max Ernst's "Robing of the Bride", a woman wears a fan like head dress. The cards in fan like forms also might contribute to the idea.